This is a tutorial-driven and practical, but well-grounded book showcasing good Machine Learning practices. There will be an emphasis on using existing technologies instead of showing how to write your own implementations of algorithms. This book is a scenario-based, example-driven tutorial. By the end of the book you will have learnt critical aspects of Machine Learning Python projects and experienced the power of ML-based systems by actually working on them. 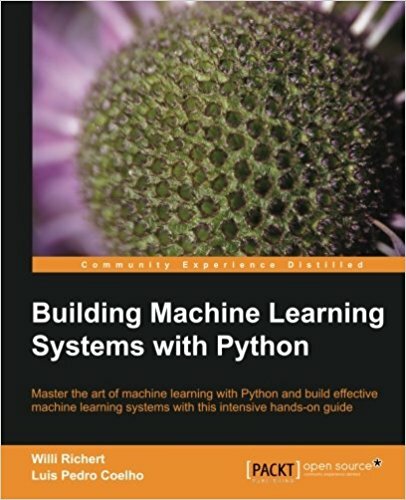 This book primarily targets Python developers who want to learn about and build Machine Learning into their projects, or who want to provide Machine Learning support to their existing projects, and see them get implemented effectively . Computer science researchers, data scientists, Artificial Intelligence programmers, and statistical programmers would equally gain from this book and would learn about effective implementation through lots of the practical examples discussed.Readers need no prior experience with Machine Learning or statistical processing. Python development experience is assumed.